AUGUST FREDERICK HAVERKAMP was born on May 13, 1894 in Camden, New Jersey to August F. Haverkampf and his wife, Elizabeth "Lizzie" Haverkampf. 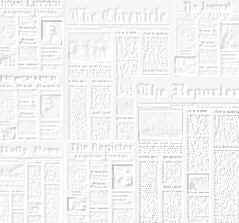 His grandfather had also been named August Haverkampf. The family which included older sister Emma, resided at 573 Van Hook Street when the 1894-1895 Camden City Directory was compiled. The elder Haverkampf was the working as a foreman for the J.C. Dunn & Company. 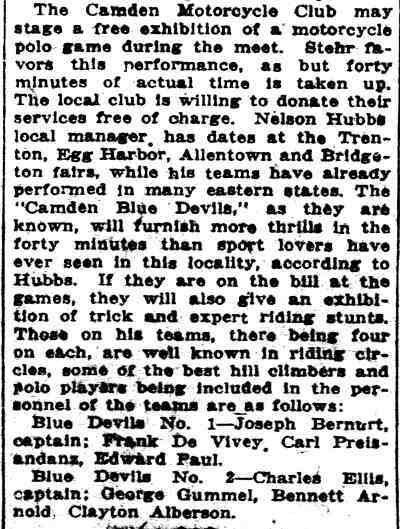 Sadly, he passed away at the age of 34, as reported in the Philadelphia Inquirer on March 8, 1896. Mrs. Lizzie Haverkamp is listed in the 1896 Directory at 935 Market Street, but had returned to Van Hook Street by 1897, her address then being 566 Van Hook Street. By 1898 the Haverkamps had taken up residence at 575 Van Hook Street. The 1900 Census shows August Haverkamp and his sister Emma residing with their mother, Lizzie Haverkamp, at 575 Van Hook Street. Also residing at the residence was a roomer, Morris Jeitner, who worked as a shoemaker. 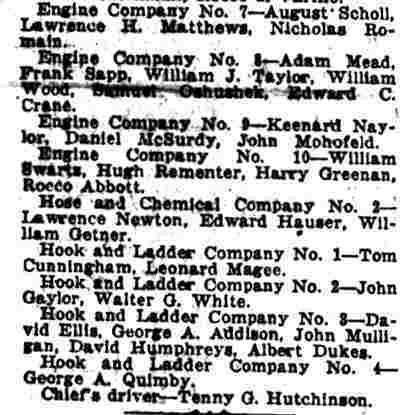 August Haverkamp appears in the 1914 City Directory, still at 575 Van Hook Street. He was working as a plumber. 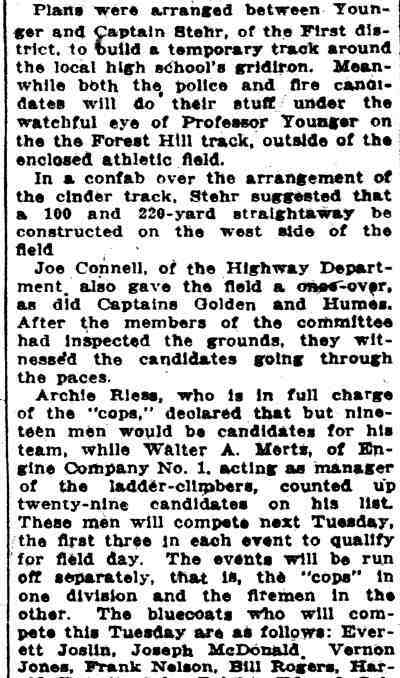 He was still single and working at the Castle Kid Company, a leather manufacturing business, when he registered for the draft on June 5, 1917. 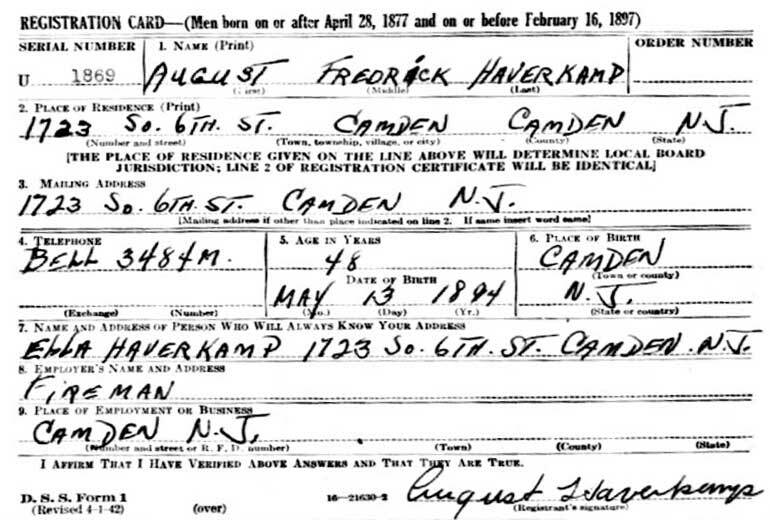 August Haverkamp was then living at 573 Van Hook Street. 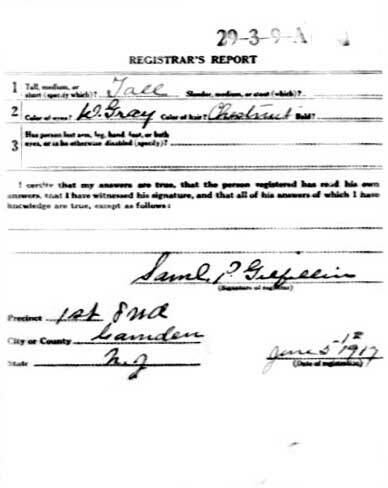 His draft card indicates that he was taking care of his father, apparently his mother had remarried at some point, but was now gone. 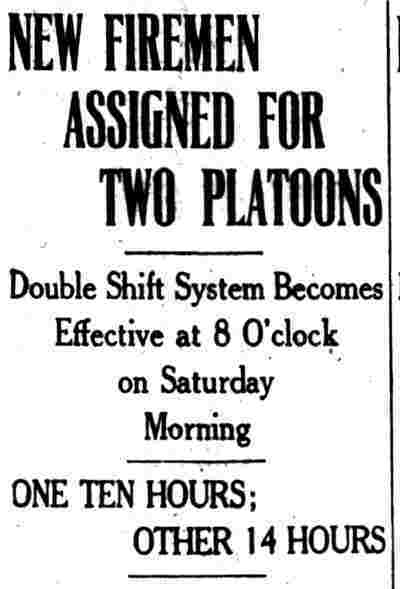 He married about that time, and served in the armed forces during World War I. Returning from the war, August Haverkamp found work as an electrical worker at the New York Shipbuilding Corporation shipyard. 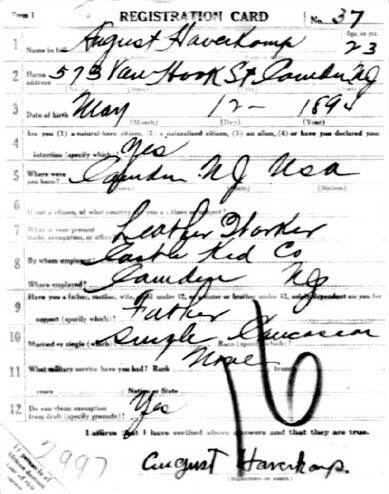 When the Census was taken on January 5, 1920 August Haverkampf was boarding at 1645 Broadway, the home of long-time Camden Fire Department member Francis D. "Frank" Chambers, who served at the nearby Engine Company 3 firehouse at 1813 Broadway. 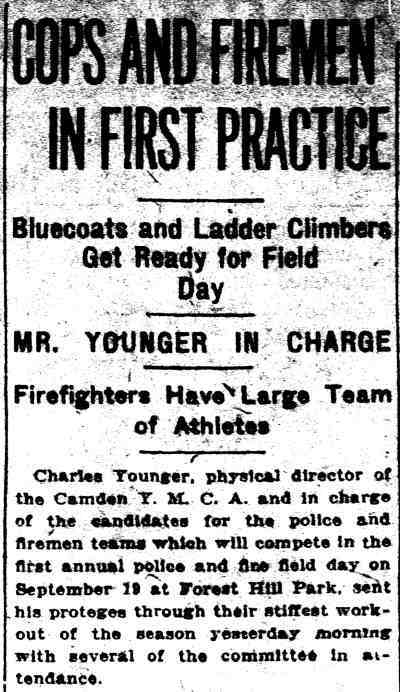 August Haverkamp was appointed to the Camden Fire Department on November 24, 1920. 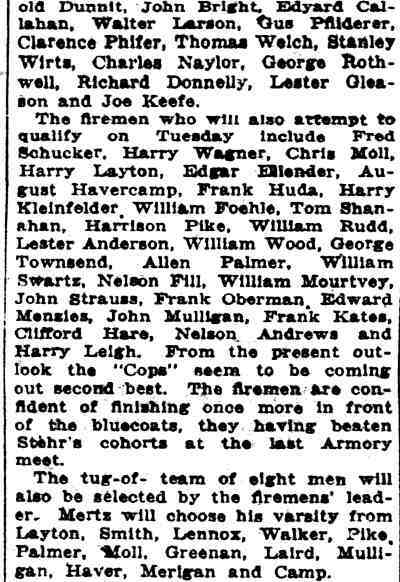 He reported for duty on January 1, 1921 with Engine Company 1 at 409 Pine Street. 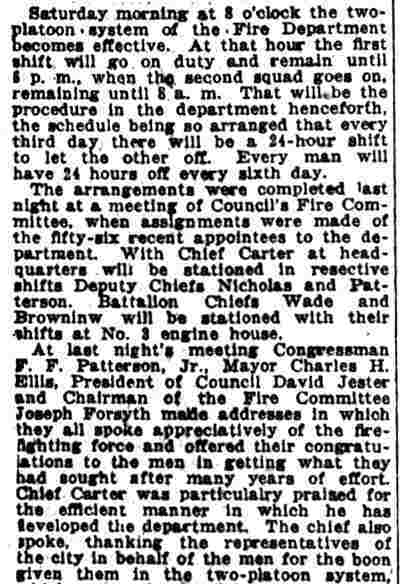 On September 18, 1943 he was re-assigned as Battalion Chief's Aide for the Third District, based at Engine Company 3's firehouse at 1813 Broadway. 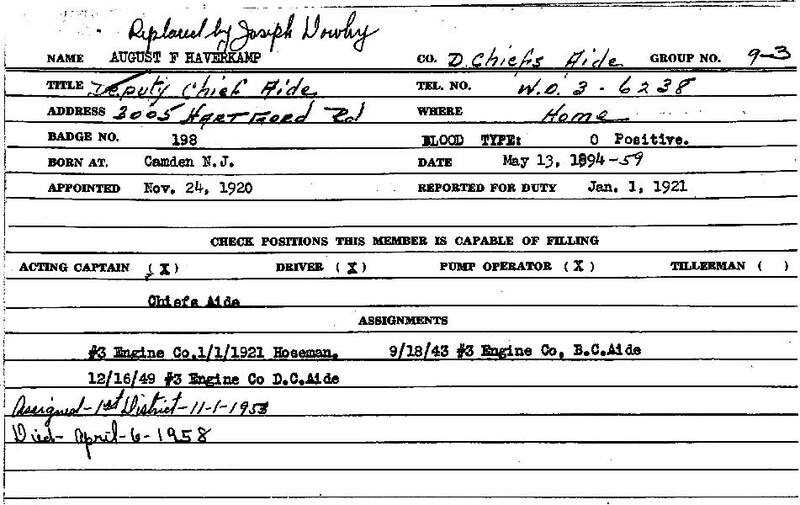 August Haverkamp held this post until November 1, 1951 when he was transferred to the First District where he served in the same role. The 1924 and 1947 Camden City Directory shows that August Haverkamp and his wife Ella lived at 1723 South 6th Street. A daughter, Julia, was born around 1927. The 1947 Directory shows daughter Julia Haverkamp, a bookkeeper, also resided at that address. By October of 1956 August Haverkamp had moved to 3005 Hartford Road in Fairview. 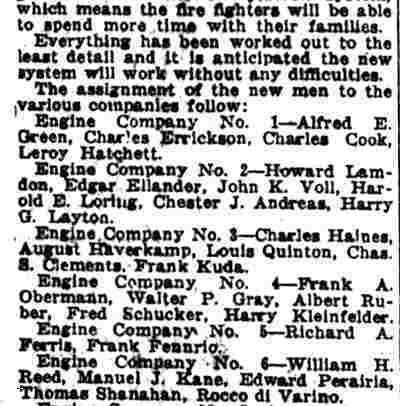 August Haverkamp was still a member of the Camden Fire Department when he passed away on April 6, 1958, at the age of 63. He was replaced on the Fire Department by Joseph Dowhy Sr.